Imagine that a movie studio green lit a big dollar movie with A-list actors. The screenplay had oomph and the director knew his stuff. The actors acted their hearts out, the costume and set were breath taking and the cinematographer delivered an Oscar worthy performance. There was just one problem- the sound was fouled up and there was no way to fix it in post-production. How many of you think that the movie will be a hit? Heck, it might not even be released. Many companies find themselves in the same spot with obsolete BI practices or tools which generates misleading output forcing users to either work with wrong insights or completely forego the application and fly blind. 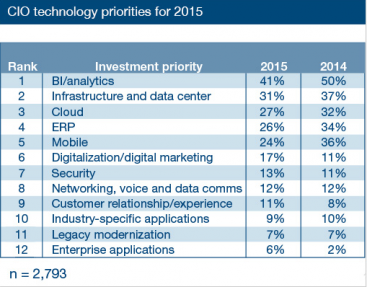 However an increasing cohort of CIOs understands how important BI is to business operations. 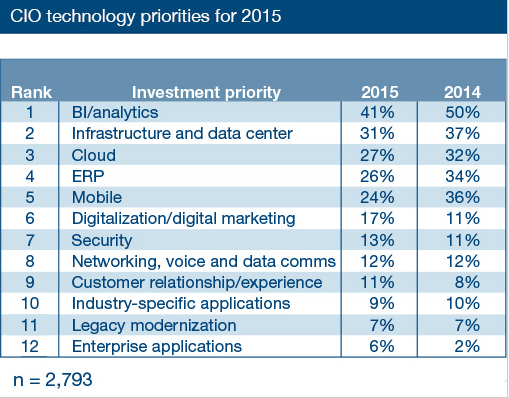 In fact, according to Gartner BI and analytics is the top investment priority for CIOs in 2015 at 41%. As your business changes your tools and standard operating procedures need to change. However, because BI involves gathering data from the entire organization a revamp has the potential to cause a substantial disruption. Which is why, businesses often stick with BI tools that are long past their use by date. Using obsolete BI tools and implementing outdated practices is like driving a car with the check engine light on- the entire contraption can break down randomly leaving you stranded. If your BI tool’s selling point is more about how many Exabyte of data it can store and process and less about what insights it can deliver time is ripe for a change. Older generation BI tools focused more on collecting massive amounts of machine data while newer tools focus more on drawing connections to business data so that users can make educated guesses and make useful extrapolations. Self-service and consumerization of enterprise software is a trend that’s gathering strength in recent years. Essentially, enterprise software has become so user-friendly that it’s as simple to use as consumer software while losing none of the power under the hood. If your BI tools need complex scripts and database programming knowledge to tease out insights they are doing more harm than good, as access to real-time business insights will be severely restricted. If your tools report how many orders were fulfilled last month or which product categories sold out the most there is nothing intelligent about that tool (think Excel). While such historical data has its importance a proper BI tool ought to be able to predict future trends and also help draw correlations between disparate data points. Traditional BI tools have limited data handling options. For example, a log file of a web server might show basic data in terms of number of unique visitors, time on site, bounce rate etc. But let’s assume that there are anomalies in the data, and on a particular day the unique visitors jumped 30%. You won’t be able to tell why just by looking at the output of the log file. However if you had a tool like Google Analytics you will be able to analyze the traffic flow and maybe find out that an influencer shared your content on Twitter driving all that traffic. Change your tool if it doesn’t let you play around with your raw data. BI tools impose performance penalties on databases, and the more real-time you want to go the greater is the load on the systems. Besides, with plenty of business data now living on the cloud in unstructured forms older tools compatible with proprietary data formats might have trouble accessing all of it. If you are using an older tool it may be that the tool can access a subset of the enterprise data resulting in garbage in garbage out situation. You need to upgrade to newer tools to get a clearer picture of your business environment. Many enterprises take a wrong approach to setting up BI projects, resulting in cost and time overruns. In many cases by the time the tool is in place the amount of data it was meant to crunch would have already grown exponentially making it limited in utility if not obsolete. If your BI tool can’t handle massive volumes of structured and unstructured data, cannot predict trends and have limited usability don’t keep using it. Bite the bullet and change it. With a proper plan (watch this space) you can make the transition to a new BI system painlessly.